The story begins with the mulberry tree and the silkworm, which is a type of caterpillar. 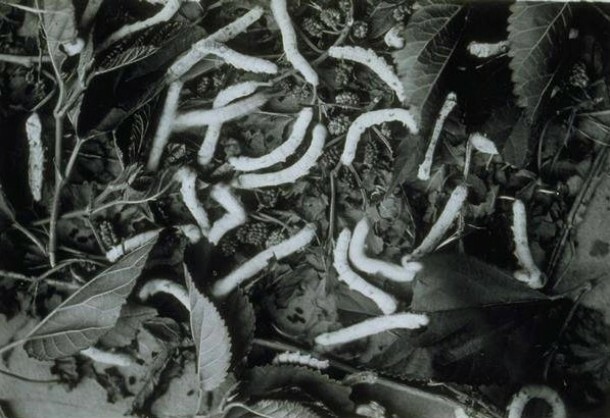 The silkworm prefers a diet of mulberry leaves. It produces a cocoon which, when unraveled, can be spun into silk thread. The process of silk production is called sericulture, and 200 years ago Connecticut, especially Windham and Tolland Counties, was the epicenter of US raw-silk production. Women usually tended to the silkworms and also reeled the thread. “Everything, it is admitted, depends on the reeling,” wrote William Kenrick in an 1835 silk-growing manual. 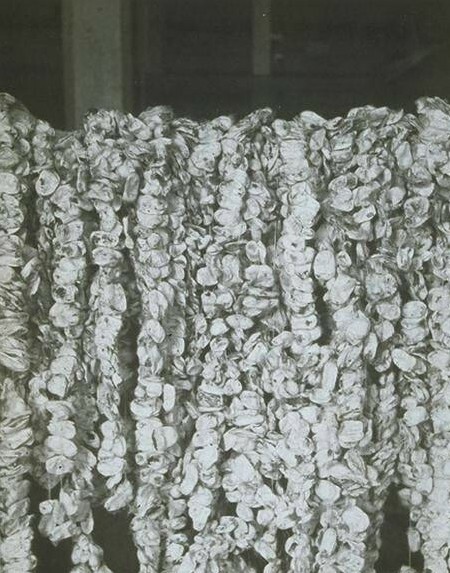 The cocoons were heated in near-boiling water to remove a fibrous outer coating and then carefully reeled, usually on a specially developed silk reel. A bar attached to the reel distributed the thread as it came out of the water. 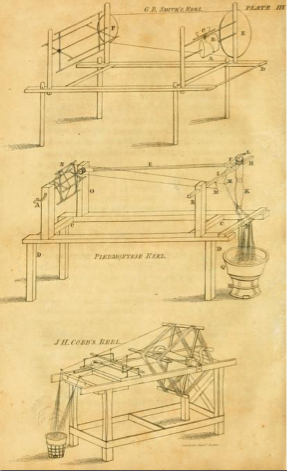 Stossel explained that the bar needed to be moved back and forth so that when the silk played out upon the spool, each strand would lie crosswise atop the others. This was necessary to prevent the silk threads from sticking together and tangling. The water had to be just the right temperature, and the spinner needed to be vigilant in adding new filaments to the reel and cocoons to the water. The process took years of experience to master. 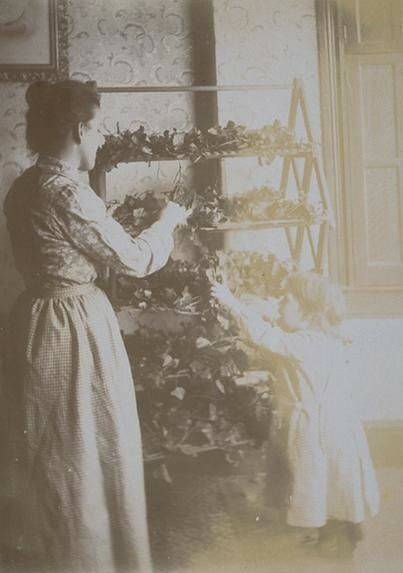 Too often Connecticut women did not have the time, and younger children who were sometimes assigned the task lacked the maturity and training. Unless the process went smoothly the silk would be uneven in size and sported fluff and even bits of cocoon and other waste. Cloth woven from such substandard silk presented an uneven appearance. As textile mills began to develop in the 1820s mill owners found it easier to import raw silk supplies from Europe and Asia than to depend on domestic suppliers, even in Mansfield, where the first mill in the nation went into operation in 1810. Meanwhile, the demanded for finished silk products was rising, and in 1824 the U.S. was importing more than $7 million in silk clothing and other products. Despite the inferior quality of domestic silk and mills’ preference for foreign imports, a mulberry or silk craze emerged in the 1830s. It may have been spurred by the arrival of a new species of mulberry, the morus multicaulis. Originally propagated in Asia and the Western Pacific, the multicaulis grew far more rapidly than the other mulberry species. It also had stalks and branches that drooped close to the ground and wide leaves several times larger than those of other species. This eased the time and expense of harvesting, prompting promoters such as Edward P. Roberts, who wrote an 1839 mulberry tree manual, to suggest these costs could be cut up to 90 percent. And there were many boosters. Congress, worried about the balance of trade in luxury items, commissioned a manual promoting silk production that was published in 1828; owners of nurseries that sold mulberry trees also wrote manuals. 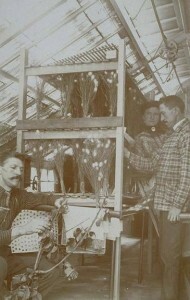 State legislatures, including Connecticut’s, offered new financial incentives or bounties that would be paid both to the growers of mulberry trees and for the number of silk reels produced. Many of the nation’s newspaper readers were farmers, and the publications featured numerous stories promoting silk production. Hardly anyone mentioned the many real difficulties of sericulture. 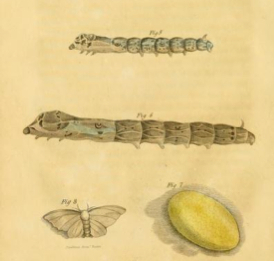 By 1830, John D’Homergue and Peter Duponceau reported to the U.S. Department of Agriculture that “suddenly and by a simultaneous and spontaneous impulse the people of the United States have directed their attention to this source of national riches…Everywhere, from north to south, mulberry trees have been planted and silkworms raised.” The Niles Weekly Register, based in Baltimore and considered by historians to be one of the nation’s most influential newspapers of its time, reported that at one agricultural fair more than 70,000 mulberry trees had been entered for various prizes. Other key players in the waning days of the craze were Ward Cheney and his brothers Frank, Ralph, and Rush. The Cheney Brothers began growing mulberry trees at their farm in Manchester, Connecticut, and a second farm in Burlington, New Jersey. They made huge profits and at one time owned 100,000 mulberry trees. In 1838 two of the brothers sailed to Europe, where they bought 65,000 trees and boasted they would make a return of 700 percent. But many of the trees died in shipping. The men returned to Europe in 1839 and bought even more trees. This time the trees made it, but they arrived just as prices were falling and panic was setting in. The Cheneys eventually declared bankruptcy but recovered to develop in Manchester what eventually became the premier silk textile plant in North America (See Hog River Journal, Spring 2005). Bob Wyss is an associate professor of journalism at the University of Connecticut who lives in Manfield and has authored two books and numerous articles. ©Connecticut Explored. All rights reserved. This article originally appeared in Connecticut Explored (formerly Hog River Journal) Vol. 8/ No. 3 Summer 2010. Seymour, Harvey. “Directions for Sowing the Seed, and Rearing the Plants, of the White Mulberry Tree,” 1834. Connecticut History Illustrated, Connecticut Historical Society Collection. Link. Stiles, Ezra. “[Excerpts from] Observations on Silk Worms and the Culture of Silk Ad 1763 - Cloth Swatches,” 1763. Yale University, Beinecke Rare Book and Manuscript Library. Link. Stiles, Ezra. “[Excerpts from] Observations on Silk Worms and the Culture of Silk Ad 1763 - Page 90,” 1763. Yale University, Beinecke Rare Book and Manuscript Library. Link. Brockett, L. P. The Silk Industry in America: A History. New York: George F. Nesbitt & Company, 1876. Link.